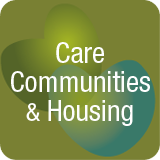 Care Communities & Housing – Care communities and the services offered are confusing for caregivers to evaluate. Here you’ll learn about the different types of care communities available and the services provided. It is critically important for caregivers to understand the housing industry and aspects that are more favorable to the industry rather than in the best interests of the consumer. What are the minimum care standards and how to do make sure your loved one receives the best care possible? Press the play button below to listen to the audio.